ROME - Italy is under severe pressure from the European Union for its 2019 fiscal policies. In late September, the coalition revealed plans to set Italy’s budget deficit at 2.4 percent of GDP. This figure exceeds the 1.6 percent level for which the technocratic finance minister, Giovanni Tria had lobbied. It also generated tension within the EU since Italy’s debt stands at as much as 132 percent of GDP. However, the government faces a fundamental problem. Italy does not have an independent monetary policy to manage employment and demand. Economic growth in the second quarter of 2018 continued to decline. It experienced an increase of less than 0.2 percent in GDP from an already stagnant pace. Household spending was low. Retail sales were in decline due to high unemployment and low income. Italy has the third-largest unemployment rate in the Euro area and as many as 11 percent of the population live below the poverty line. The EU says that 30 percent of the Italian population is at risk of poverty and social exclusion. The government claims an export-led recovery is possible yet net exports made only a modest contribution to economic growth over the past three years. Industrial production from January to June dropped at an annual rate of 0.5 percent. 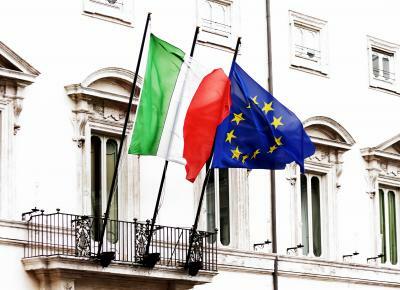 By supporting the country’s economic activity, the Italian government may be able to arrest the financial downturn which some commentators believe to be inevitable. Furthermore Italy’s projected deficit is well within the Euro area budget rule. The formal deficit limit in the monetary union is three percent. However Italy’s debt ratio is already the second highest in the Eurozone, and there is a risk that the proposed budget would increase debt further. The government would be forced to borrow large sums of money. Valdis Dombrovskis, Vice President of the European Commission, cautioned Italy could face “sky-high interest rates” that could reduce disposable income and therefore limit growth in consumer spending. This would hinder economic growth. The coalition’s budget proposal is already influencing investors. According to data provider IHS Markit, more than 35 billion dollars of Italian bonds are out on loan, a whopping increase from 23 billion dollars last year. This underlines investors’ negative outlook upon the budget proposal. Yet it is certainly open to the Government to maintain that a policy of fiscal austerity would not solve Italy’s debt crisis. It would simply prolong the perpetual state of decline in the Italian economy. The alternative, they say, is to adopt policies with the aim of reducing unemployment and poverty by supporting economic growth and infrastructure spending. This may be a risk, but, on this analysis, one worth taking. Italy, a country famed for its incomparable contribution to countless industries’ success worldwide, is trapped in a long-running economic crisis. It should be supported rather than attacked in its quest for economic revival and praised for willingness to take audacious steps to end poverty that could be a beacon for similar schemes throughout Europe.